Busan is four hours away from Manila. It is South Korea's second-largest city, and home to more than a million people. As the plane banked to the right and started its descent towards Busan, the black void outside the window slowly transformed into clusters of lights. From a few thousand feet above ground, Busan is teeming with life. We were greeted by the subzero winter climate of Busan as we exited the terminal. The first five minutes was fun, but moments later, it was agonizing. After checking in, our first agenda was to eat something spicy. It's one of our ways to keep ourselves warm from the bitter winter cold. The following morning, it got even colder even if the sun was up, and the sky was clear and blue. First stop was Haedong Yonggungsa Temple. Built in the late 14th century, this Buddhist temple is one of the few in Korea located along the seaside. The view was spectacular! Next stop was Haeundae Beach, one of Busan's famous tourist destinations. The area reminds me of Manila's Roxas Boulevard, only that Busan's a hundred times cleaner. It was sunny, but the temperature was still below zero. It was my first time to wear four layers of clothes at the beach. And oh, we were surprised by the flock of seagulls flying around the beach. It was cool and funny at the same time because we were trying to evade their 'bomb' (if you know what I mean). Yep, we were outnumbered by them. You have no choice but to ruuuuuuuun! Take me to the beach... but not during winter. 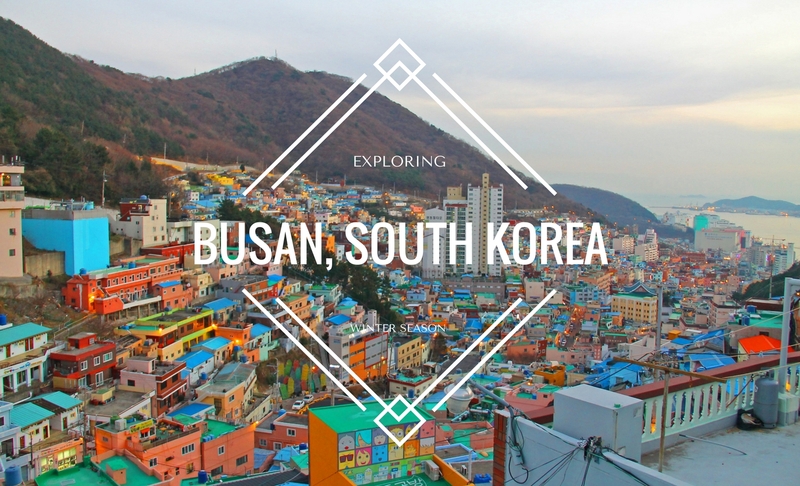 Busan is surrounded by towering mountains and cerulean seas. That's why every corner of this city offers a majestic view. Busan's Oryukdo Skywalk perches at the edge of the cliff. This is a perfect place for those who want to battle their acrophobia since the skywalk is made up of hard plexiglass. But hey, the view's worth it... except facing the entrance where there were a lot of people taking selfies. Lol. Oryukdo which literally translates to 'Five or Six'. After appreciating the view in Skywalk, we rode a bus to Gamcheon Cultural Village. This attraction is known for its twisting alleys, steep streets, and brightly painted houses which were restored and repainted for years. There are a lot of fancy restaurants and gift shops along the way. When in Gamcheon, don't forget to take a photo with The Little Prince. During our time, the queue was really long, and we can no longer wait since it was getting dark. Steep street of Gamcheon Cultural Village. The 'Santorini' of Busan. Lovely view. Finally found The Little Prince! Like Filipinos, Koreans also have a knack for shopping. It's not surprising that there are several shops in almost every major thoroughfares of the city. Nampo-dong is Busan's version of Seoul's Myeongdong. They have numerous shops and a lot of street food stalls. Despite the cold, strolling around Nampo-dong was nonetheless fun. To cap off our day, we feasted ourselves with huge slabs of samgyeupsal. Korean street foods are very delicious! Busan did not disappoint. Honestly, it's a chill place to explore. The mass transportation system is very efficient. Most people understand basic English, but be ready to get lost in translation. For those who got eaten by the K-Drama system, your DIY 'Korean Language Proficiency' skill might help you. Chinja? Aneyo! HAHAHA! Special thanks to my good old friend Mikki (@mikkirat) for touring us around. This is just the beginning of my Winter Adventure in Korea. There's more to come! Demn, those beachside views!!! Aaah, I can't wait to go to Busan!!! Hi, I was wondering how you got around Busan? Hey, Sarah! By train and bus. :) It's easy to navigate around Busan. anong ginamit mong pang navigate for train and bus? gumana ba google maps? Hi Carmi! I only stayed two days in Busan. On our third day, we rode a bus and went to Seoul. Hello! I used an 18-135mm f/4.0-5.6 lens for this trip. Hi. would you able to add in how you reached those places? Hiii, can i know. What kind of bus that u took to get back to Seoul from Busan? And the price. Hope you might help me thankyou! I'm not really sure. My friend booked us a one-way bus to Seoul. We just paid him right after. May i know where did you stay in Busan? I'm not sure if its just my internet connection but images are broken but overall it seems like Busan is a very exciting place to visit! My photos are all fine. Prolly it's your connection. Sir for PH passport holder going to Busan, do I need to apply for visa? Sir for PH passport holder going to Busan and from there I will travel to Seoul by bus, do I need to obtain visa?